This beautiful book is a resource for those who want to create a contemplative garden or to better understand what it is to follow a contemplative path. It will be of interest to landscape architects and designers, anyone interested in the fusion of East and West in cultural expression, and garden lovers everywhere. 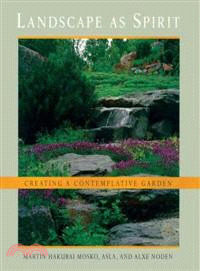 It explores the innovative approach to garden and landscape design found in the work of Martin Mosoko, a landscape architect and Zen teacher working in the Rocky Mountain region of Colorado. Mosoko's work incorporates principles of Oriental and Western garden design to make bold and original statements in his landscapes. Mosoko explains how to deploy the materials of the garden so that their arrangement reflects the contemplative mind. The chief paradigm he uses is the mandala, a symbolic picture of the ideal world used in some form in many of the world's cultures. Rocks, streams, plants, paths, and structures of the garden each take their place in the mandala as one of its five elements: Earth, Water, Fire, Air, and Space. The means to produce a balance of these elements is the mind conditioned by meditation and a clear understanding of its own nature. Inner harmony is expressed as outer beauty. Mosoko's approach to landscaping transforms space into spirit, infused with magic. It can be used to create anything from a small courtyard to a country estate, in any environment from the city to the suburbs. After explaining theory and method the book leads us into five of Mosko's gardens, each alive with the energy and excitement he brings to his designs. Although located in different parts of the country and created in different styles, each garden is a reflection of the mind of clarity and calm. Martin Hakubai Mosko, ASLA, founded the landscape design and construction firm Marpa & Associates in 1974. He studied painting and Sanskrit at Yale, and has apprenticed with Japanese master gardeners. Mosko is a Zen monk and heir to the lineage of Tenzan Keibun Otokawa Roshi, and trained in Tibetan Buddhism with Chogyam Trungpa Rinpoche. In addition to his responsibilities at Marpa, he is abbot of Hakubai Temple and travels the country lecturing on garden design and meditation.